If you’re in the market for Samsung Galaxy phones (or tablets), Samsung is having a sale right now on their lineup of Galaxy devices. Some prices have gone lower, but in the case of the Galaxy Tab, the recent price drop has just prompted an extra freebie from Smart instead. As usual here in The Technoclast, we’ll compare these new prices to the ones currently posted in CMKCellphones to see which ones are favorable to buy wherever. 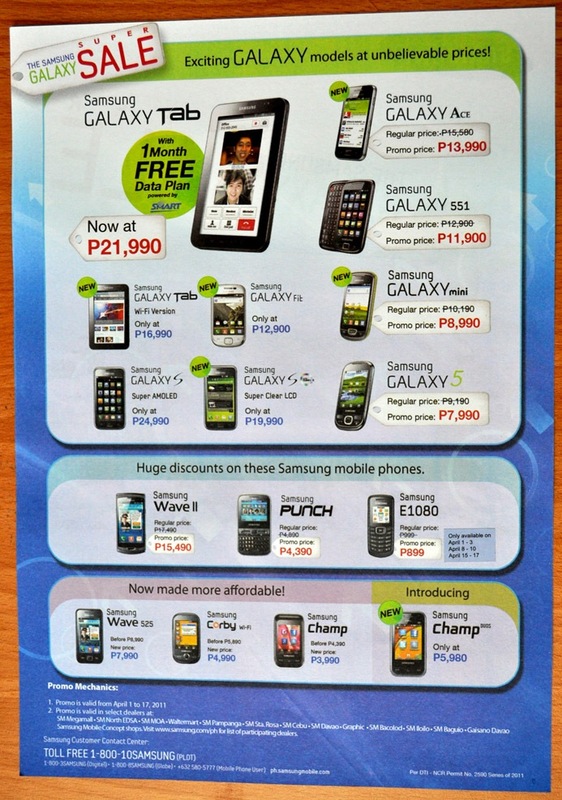 We’re not endorsers of CMK, but they do have some competitive prices on the most recent mobile phones out there. Whichever the case, the prices are still falling pretty low these days and there’s not much stopping you from availing of any of these low priced phones. We think for the low end, the Galaxy 5 might be a pretty good deal, and the Galaxy SL Super Clear LCD variant is pretty good. Though if you can shell the extra cash, the Super AMOLED variant is still very much the best.